We’re so accustomed to paper labels on bottles these days (perhaps port and madeira are the only mainstream wines where some bottles still have words stencilled directly onto the bottle for primary communication of their contents) that it’s hard to think of a time when they didn’t exist. The crucial date seems to be around 1860, when glues were developed that could stick paper to glass. I can’t recall ever seeing Cape wine labels from the 19th century, but was sent some photos of six of them by Hennie Taljaard the other day, and I reckon some others will be as interested as I was. 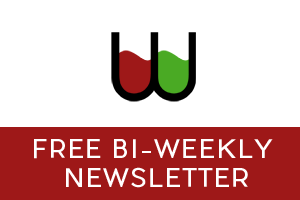 Hennie is a great wine-lover who is also (and this is much rarer) deeply interested in the cultural history of wine, and a collector of old SA wine books – he’s published an article on “vinous Africana”, which is available, together with other fascinating tidbits, on his blog. He bought them from an American label dealer, who told Hennie they came from a late 19th century label collection. Which makes sense when we look at the labels. Actually, the first thing we can see when we look at them is that the basic designs are surely generic – standard, multi-purpose cartouches and frames into which words have been placed. Have sometimes been squeezed, in fact, even rather crookedly, as a close examination of the Sweet Constantia Pontac label (left) suggests. 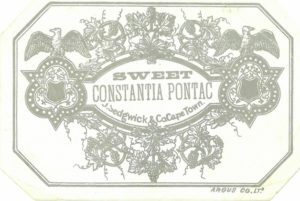 Very typically for the time, there is no producer/estate mentioned, just the merchant who sold the wine – in this case J. Sedgwick & Co, Cape Town, the company founded in 1853 to distribute liquor and tobacco (and continuing to this day – Sedgwick’s Old Brown “sherry” is no doubt its most famous product). But the grape variety is mentioned, which would have still been pretty unusual at this time, when most wines were still given generic, usually European, names. 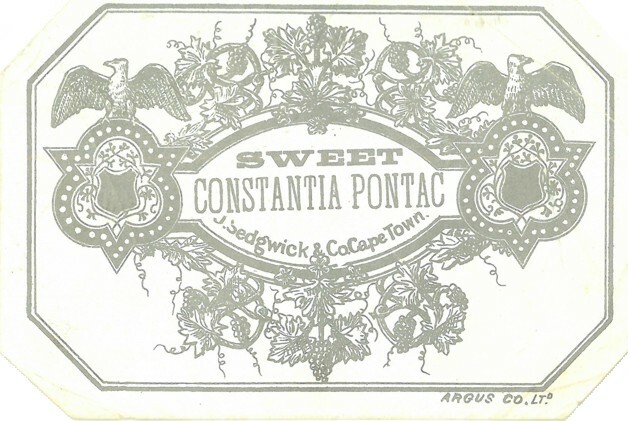 Pontac, a red-juiced variety known in Europe as Teinturier, was important in the sweet Constantia wines of the 19th century, but declined sadly and has now disappeared from Cape vineyards (for the time being at least – watch this space). 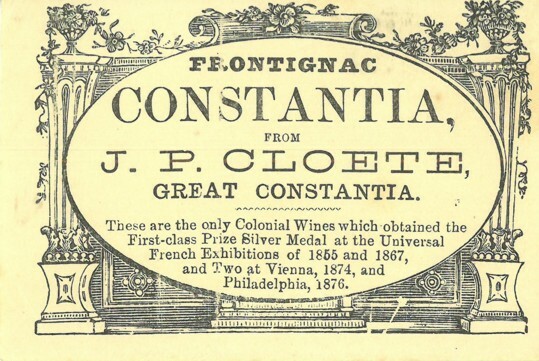 Another famous variety associated with Constantia is mentioned on another label: Frontignac, the red version of Muscat Blanc à Petits Grains which might have been a different mutation of the variety we now call muscadel or muscat de Frontignan. I wonder where this label was printed? If not locally, then perhaps England, given the “Colonial” reference? It doesn’t mention the distributor (if there was one) or the printer, unlike the first label which indicates it was printed by Argus (in Cape Town). 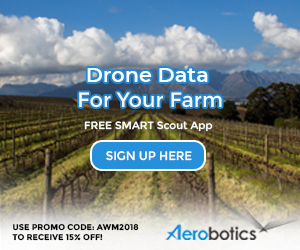 Probably modern day Groot Constantia could help here. We might have thought it easier to narrow down the date of this label, given that it mentions, in conjunction with Groot Constantia, its owner JP Cloete, who died in 1875. But look at the proud list of awards (precursor of all those medallions adorning bottles today), and see that it mentions one from Philadelphia in 1876 – after Cloete’s death. We could perhaps reasonably guess that the wine itself came from shortly before his death, or the year he died, and that the label was printed shortly thereafter. Presumably, Cloete’s name and famous association with Groot Constantia was significant enough to be invoked even after his death (by the way, he left Groot Constantia insolvent, and it was bought by the state a decade later). The wine is not given as coming “from Groot Constantia”; note the comma: the wine comes from “J.P.Cloete, Groot Constantia”. But even more important than his name, or that of the specific farm, and more important than the variety, is the name of the famous area from which it came: Constantia. That was the significant brand at the time; the producer was comparatively irrelevant. Before someone else points out my inability to read properly and carefully, let me amend my last para (in the light of what I’ve just noticed): the name of the farm given on the label is not “Groot Constantia”, but “Great Constantia” – I suppose further indication that this label was printed for the British market. I loved the article Tim! Ja, Hennie is a special chap with a wealth of wine knowledge.